Q. At what age can a child begin dance? A. 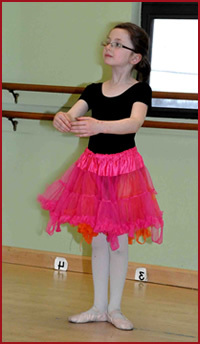 We offer dance classes for children beginning at two years old and teach students of all ages over two! Q. Can I reduce my tuition payment for missed classes? A. No, but it may be possible for you to attend another class for make-up. Please contact the studio to make arrangements. Q. What if the dancer is late to class? A. We do understand that arriving late is at times unavoidable since things sometimes happen and our lives are very busy. Please try to be on time as having dancers arrive late does disrupt the class. Q. How do you communicate with parents/guardians and dancers? A. Email is used as a regular form of communication since it is an efficient way to reach as many students as possible. Please check your email on a regular basis. If you do not have access to email, we will provide you with a hard copy of all information that is distributed via email. If you have not already given us your email address, please do so. If your email address changes, please contact us to provide an updated email address. Q. What should I bring to the dance class? A. Dancers should always bring a smile, a bottle of water and appropriate dance attire and shoes to class. Please make sure all items are properly labeled! Q. I am a beginner. Do I need to know anything before I come to my first class? A. Bringing proper dance attire is as necessary as bringing a bottle of water and warm clothes for leaving the facility in cold weather. We will make every effort to place beginners in classes with other beginners. Therefore, it is not necessary to worry that you will be unable to keep up as all students in your class will be at the same level of ability. Q. Does the studio offer dance wear apparel? A. Yes. For your convenience we offer dance wear at the studio as well as shoes and leotards. Sweat shirts, T-shirts, Tank Tops, Warm-up Jackets, Capri Pants, Dance Bags, & Garment Bags bearing the school logo are also available. Q. May I watch my child's dance class? A. Yes! Our studio is equipped with Closed Circuit TV for you to view your child's dance class. In addition, we have scheduled “Watch Weeks’ two times during the year to encourage parents to watch the class. However, if a child is having a difficult time separating, we do encourage parents to walk them into the classroom and in some cases stay for a while to help the dancer adjust. We understand this can be a time for separation anxiety and we want both dancer and parents to always feel welcome at North Andover School of Dance! Automatic Withdrawal: Simply authorize North Andover School of Dance to withdraw your tuition from your checking or savings account each month. Credit Card: Pay automatically by credit card and authorize North Andover School of Dance to charge your monthly or quarterly payment to your Visa or MasterCard. It only takes a few minutes to enroll! Paperwork is available at our studio. Tuition is based on 36 weeks of classes and is divided into monthly installments for your convenience. Scheduled holidays and closures are accounted for in the monthly installment calculation. You will receive a monthly bill via email at the end of each month for the following month. Any tuition received after the 15th of the month will be subject to a $15.00 Late Fee. You will be responsible for any charges by the Bank if a check is returned. Adults can pay by the class or purchase a class card. A. Yes. We offer discounts based on the number of classes and for families. Tuition is graduated, the more classes you take, the less you pay for each class. Family discounts are offered! If more than one family member is dancing at North Andover School of Dance the first dancer is charged full tuition, the second dancer receives a 10% discount, and the third dancer receives a 15% discount off the monthly tuition! A. Yes. There is a one-time, non refundable registration fee of $25 for new students. Q. If a dancer chooses not to continue dance, is he/she still responsible for payment for the entire year? A. No. A dancer is only responsible for paying for the number of classes a dancer has taken. Note that registration fees are not refundable. Q. Can dancers at North Andover School of Dance participate in competitions? A. Yes. We offer dancers the choice between two programs, Dance for Fun or Dance Intensive. Our studio does not emphasize one option over another as we want all of our students to experience the joy of dance. Advancement in dance does not require our students to compete in the intensive program. Q. Does your studio have an end of year recital? A. Yes. We encourage all dancers to participate, but it is not required. Students will be included in the preparation and the choreography whether they choose to participate in the recital or not. Q. What other opportunities are there for dancers to perform? A. We offer many opportunities for our dancers to perform including community events that we participate in and special shows that we offer to our dancers. Such events include a Holiday performance, Thanksgiving Day parades, performances at nursing homes, an annual fund raiser show for various charities, and performances at Disney World and on the Royal Caribbean Cruise Lines. A. Classes run the length of the school year, starting in early September and finishing at the end of May; however we offer open enrollment. We also offer summer programs and workshops so be sure to visit our website for updates! Q. Can students start midyear? A. Yes! We welcome dancers to join us throughout the year. Availability may range based on the class. We also encourage dancers who have joined us during the year to participate in the end of year recitals, if they would like. Q. What happens if class is canceled due to inclement weather? A. We do not follow the local school cancelation policies because the weather conditions may change as the day goes on. Please call the studio for cancellations or check our website for updates.